Expecting an all yellow litter due mid May. At Bellbidgee Labs, I strive to produce stunning labs with exceptional temperaments. Ellie is a super girl and has previously produced great family dogs, and stunning daughters: Misty & Maddie currently in my show team, are getting consistent results. I only breed a couple times/year, putting my heart & soul into my puppies. I will support you on the journey and throughout the life of your lab. Many buyers become lifelong friends. Price: $2,500 - Limited Registration with DogsNSW. Please see my Facebook page for more info, photos & updates. 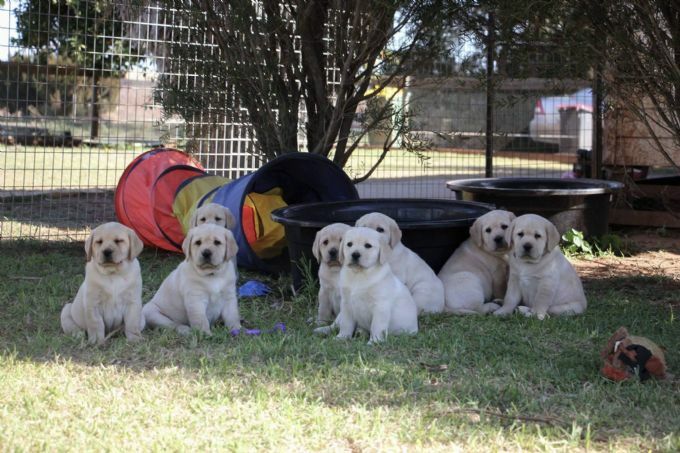 Each Bellbidgee Labrador is raised in a loving home environment and provided with lots of stimulating play and interactions to aid in development. I am passionate, and care a lot about my dogs and offer ongoing support at your leisure. Please contact me for a questionnaire, and to register on the waiting list. I always provide a thorough puppy handover so you know how to take care of and raise your puppy, and am available for the life of you puppy for follow up support and guidance. Dogs NSW Member 2100064234. Please contact Dogs NSW on email: [email protected] to verify my membership.